Microsoft on Monday announced a version of Windows that runs over the Internet from inside Microsoft's own data centers. "It's a transformation of our software and a transformation of our strategy," said Ray Ozzie, a computing industry pioneer who now serves as Microsoft's chief software architect. 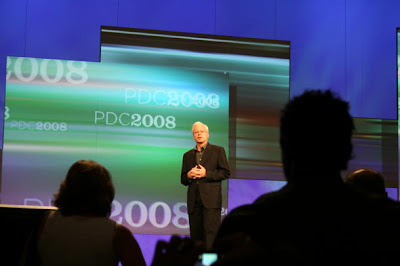 In photo : Ray Ozzie delivers his keynote address at Microsoft's Professional Developers Conference. 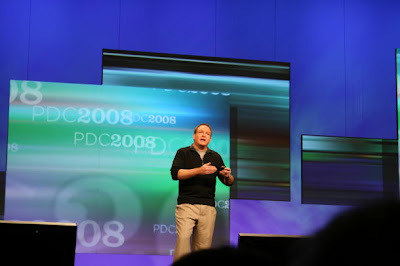 Microsoft first outlined a shift to "Live Services" at an event in San Francisco in 2005. The company has released a few things piecemeal, such as Live Mesh, but Monday's announcement marked the first real discussion of how Microsoft's disparate Internet strategies fit together. The announcements come at the start of Microsoft's Professional Developer Conference here. On Tuesday, Microsoft plans to go into more detail on Windows 7, the successor to Windows Vista, due out by about January 2010. With the launch of Azure, Microsoft will find itself in competition with other providers of Internet storage and computing services including Amazon, Salesforce.com, and Rackspace. Ozzie said he was tipping his cap to Amazon founder Jeff Bezos for innovating the hosted computing model. Amazon "established a base-level design pattern, architecture models, and business models that we'll all learn from," he said. Microsoft is making Windows Azure in preview form to developers, with a limited subset of the features that it plans to have in the product before its final release. 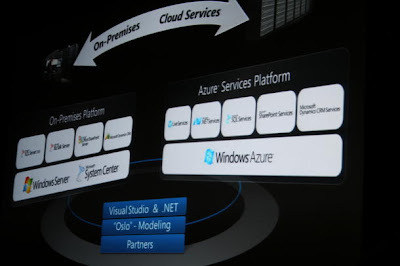 There weren't many details on how Microsoft will charge for Azure, saying it will be free during the preview period. Final pricing, Ozzie said, "will be competitive with the marketplace." The company itself plans to offer businesses the option of running over the Internet the kinds of software that have traditionally run on a company's own servers. Microsoft already sells its Exchange corporate e-mail software in this way, but that is just the beginning, said Microsoft vice president Dave Thompson. "All our enterprise software will be delivered as an online service as an option," Thompson said. 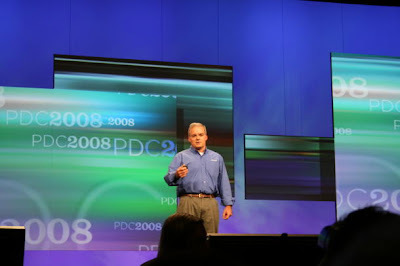 In photo : Server and Tools senior VP Bob Muglia talks about the benefits to businesses of Windows Azure. In Photo : Microsoft's cloud computing team discusses how a common set of tools can be used for developing applications for traditional Windows as well as for Windows Azure. In photo : Microsoft's Dave Thompson tells attendees at the Professional Developer Conference that all of the company's enterprise software will be offered as an online service over time. One of the biggest challenges in business software, whether it lives inside a company or is part of a hosted service, is making sure that only properly authorized employees have access to the data and applications. 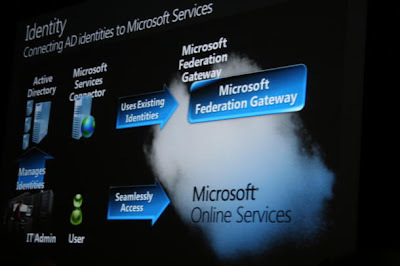 Microsoft discusses how its Federated Identity platform will work with the new hosted services.